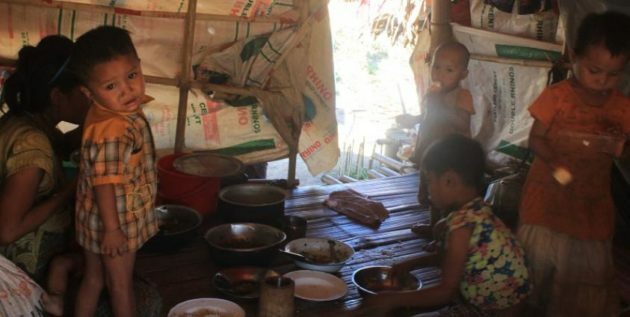 Over ten households have recently arrived in Myaing Gyi Ngu Internally Displaced Person (IDP) camp in the Karen State, where more than 5,000 IDPs are taking shelter, according to the camp officials. Aye Linn Myat Shin IDP Camp’s in-charge Saw Shwe Tun said 28 people from 14 households from Par Pa Lo Khee Village under Hlaingbwe Township arrived in Myaing Gyi Ngu IDP camp on March 10. “They said they are afraid to live [in the village] due to many landmines. They were asked to leave the village. They said ‘Kho Phone Thant (Black Turban) asked them to leave. Since they do hillside cultivation, they can’t work there anymore. They have no business to do so they came to the camp. We haven’t collected the list [of new arrivals] in details,” he told Karen News. The recently arrived households left home due to fear of landmines in their area after their cattle have been damaged by the landmines. Currently, the households are taking shelter in their friends’ tents in Myaing Gyi Ngu IDP camp as there are not temporary tents and food supply for them. IDPs have been living in Aye Linn Myat Shin Camp and Mya Pan Wut Hmone Camp under the supervision of Myaing Gyi Ngu Sayadaw after fighting broke out between the Democratic Karen Benevolent Army (DKBA) splinter group and the Border Guard Forces (BGF) in 2016. According to statistics compiled by the camp officials, 5,569 people are currently living in Myaing Gyi Ngu IDP camp. Over 7,000 residents have fled from home in the Karen State due to the recent skirmishes in Hpapun, Karen State.